A one-man show about an artist’s struggle through hip hop and nightlife in New York City. The Market Theatre Laboratory invites you to behold this wonderfully creative retelling of of a true story, through the eyes, voice, words and rhymes of Malik Work. Work and his band started a musical movement years ago in New York City. What was first billed as a hip hop reality TV series in development, became renowned for the groundbreaking sound that crowds flocked to every Tuesday night: THE REAL LIVE SHOW. 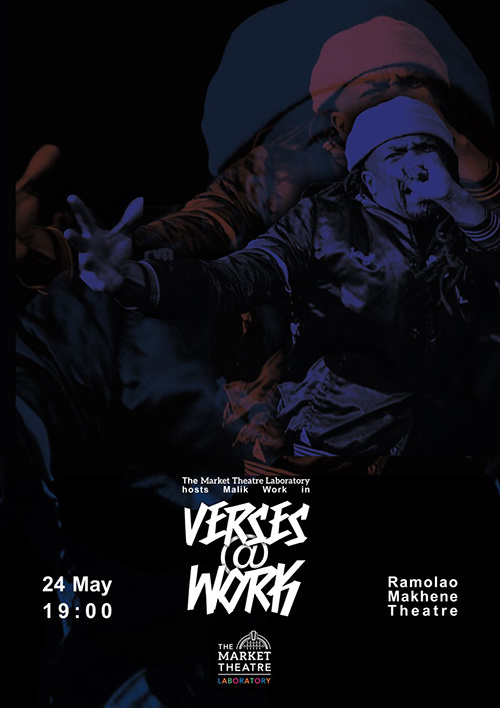 Featuring original music by a variety of NYC’s finest jazz, dance, groove, and hip hop music producers, VERSES AT WORK gives a sneak peak into the adventurous world of live music born in the depths of bars and clubs in the East Village and Lower East Side of New York City. The line between hip hop and theater are blurred in this compelling one-man show. Malik Work’s story captures the urban artist’s resilience, and proclivity to rise, fall, then rise again. Through extremely personal anecdotes, Work paints a portrait of the artist as a young man become grown, on the unforgiving city “blocks” he’s been trying to escape. Turned off by the acting business as a college graduate, he fully embraces an identity as an “emcee” and a musician. Hip Hop allows him to “write his own scripts,” hence becoming the author of his own story. The show also documents the beginning of an era where hip hoppers begin merging with the jazz elite. Around the turn of the millennium, the music they are making is exciting crowds in an unprecedented fashion. Work, originally known to fans as ‘Dionysos’, gets lost in the excitement. He finds himself through his verses, reflecting on love, loss, and the struggle to become a better person.